"Thanks for that piece of software! It works great." "Great bit of software. 10/10." The CR2 codec supports the latest camera bodies and models from Canon, including the EOS 6D, EOS 5D Mark III, EOS 70D, EOS Rebel T5i, EOS Rebel T5, G16, PowerShot G1 X, and PowerShot S120. 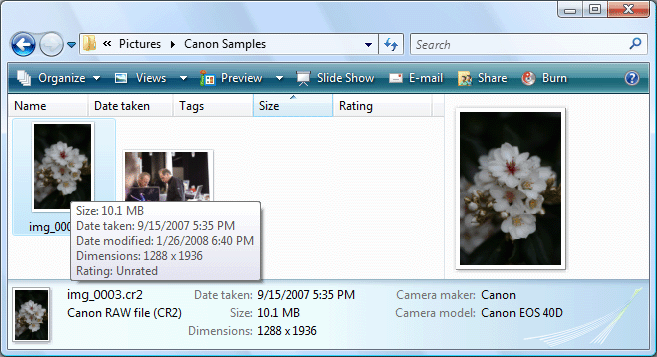 Even if we can't decode the RAW data for your camera model, we will use the embedded JPEG preview. This should allow the codec to be useful for the latest models immediately without waiting for an update from us. The 32 bit MSI and 64 bit MSI files that are included in the installer are available for administrators who need more installations options than are available in the default installer. On 64 bit platforms you should install both 32 bit and 64 bit codecs if you need to support 32 bit applications that use WIC. The Setup application above does installs both. If you purchased a license, then the registration information can be entered in the Preferences application in the CR2 Codec by Ardfry Imaging program group. Stay up to date on the lastest versions of our software by following us on Twitter and Facebook. Fixes issues with generating large previews in the Windows Explorer Preview Pane on high resolution monitors. Download the free 15-day trial of the CR2 CODEC today.